With their fuzzy, heart-shaped leaves and charming flowers, African violets (Saintpaulia) are one of our most popular houseplants. They need regular attention to look their best, but they are not difficult to grow well once you understand their needs. One aspect that makes a big difference is keeping them well-watered. African violets need soil that stays moist but is never soggy. There are several ways to achieve this. Grow your African violet in a pot with good drainage, using light, loose potting soil. African violets have fine roots, and heavy soil stunts plant growth and flower production. 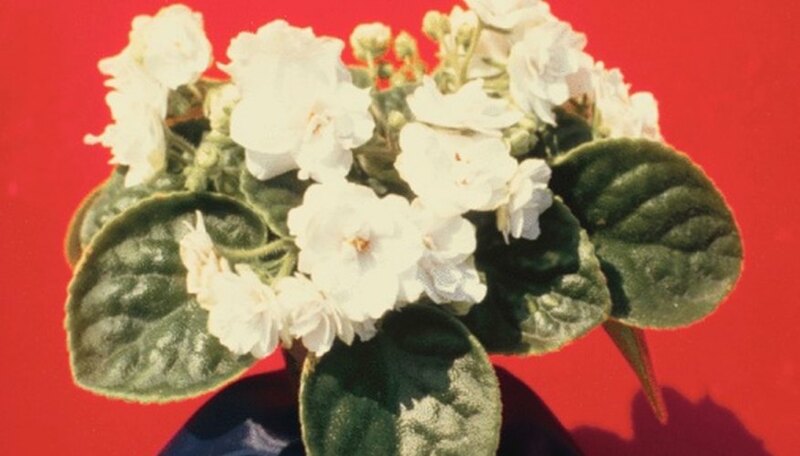 In addition, loose soil helps prevent root rot and stem rot, two diseases that African violets are susceptible to in heavy soil. Water when the top 1 inch of soil is dry to the touch. However, don't wait until the plant starts to wilt, as that interferes with flowering. Your goal is to keep the soil consistently moist but not soggy. Water your African violet from the top by pouring room-temperature water onto the soil surface until water drips out of the drainage holes in the bottom of the pot. Be careful not to get water on the leaves. Check the pot in 30 minutes and discard any excess water that has accumulated in the saucer underneath. Water African violets from the bottom by filling the saucer under the container with water. If the pot doesn't have a saucer, use a small bowl. Once the soil surface is moist, pour off all water remaining in the saucer. Check the saucer in half an hour and pour off any standing water. Maintain constant moisture in your African violets by using a wick. Commercial African violet watering wicks are available, but 2- or 4-ply synthetic yarns and pantyhose work well, too. Insert one end of the wick into the drainage hole at the bottom of the pot and spread it out evenly over the inside bottom, then plant the violet. Water the plant well the first day from the top. Insert the other end of the wick into a water reservoir and the plant roots will stay constantly moist. Grow your African violet in a two-part ceramic violet pot, available at garden centers. These specialty pots have an inner pot, glazed only on the top edge, that absorbs water through its unglazed sides. Keep the outer, glazed pot filled with water at all times. Add diluted fertilizer to the water, if desired. Flush the pot from the top once a month to reduce salt buildup on the soil surface. African violets grown in these pots need very loose, porous soil and should be repotted every year.